How Can Older Adults Manage Diabetes as They Age? The changes that occur with aging can impact the ability to control diabetes. For instance, changes in metabolism and hormones can alter blood glucose levels. However, this doesn’t mean your senior loved one has to give up and accept that his or her diabetes will spiral out of control. Instead, use these strategies to stay ahead of the game so your loved one is better able to manage diabetes. One of the biggest reasons diabetes becomes more difficult to control in the senior years is the introduction of new medications to a person’s healthcare regimen. 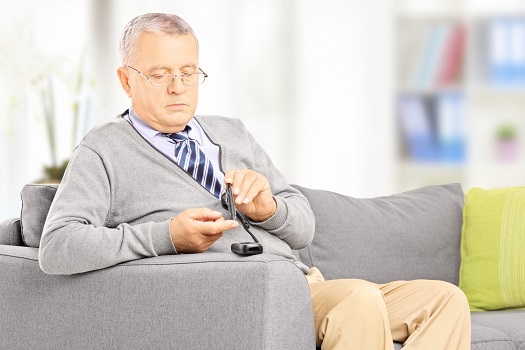 Always ask how a new medication could interact with your loved one’s current diabetes management medications, and be alert that some seniors may have fluctuations in their blood glucose levels when they begin a new drug. If your senior loved one lives alone, you may not be able to monitor his or her reactions to medications closely, but a trained professional caregiver can do this and much more. Living with a serious health condition can make it challenging for seniors to age in place. However, they can maintain a higher quality of life with the help of professional live-in care. Winnipeg seniors can benefit from assistance with meal prep, bathing, transportation to the doctor’s office, medication reminders, and much more. During sleep, the brain performs processes involved with the regulation of hormones that affect blood sugar levels. Chronic sleep deprivation can also affect insulin sensitivity. Aim for your loved one to get at least seven to eight hours of high-quality sleep a night so his or her metabolism stays stabilized. Diabetes is more difficult to control when a person is ill, and seniors are more susceptible to illnesses and injuries that tax their body’s energy reserves. Help your loved one maintain a healthy immune system by ensuring he or she follows basic lifestyle principles such as staying active and eating right. Keep in mind seniors who begin a new exercise routine or diet should only do so after consulting with their physician to make sure it won’t affect their current diabetes management plan. Even if seniors have mobility issues or health challenges, they can still get the benefits of exercise and proper nutrition, especially with the help of a trained professional caregiver. Winnipeg in-home care professionals can be a wonderful boon to seniors. Whether they require around-the-clock supervision or just need assistance with exercise and household tasks a few days a week, seniors can enjoy a higher quality of life with the help of trusted in-home caregivers. Seniors who drink alcohol often find the body metabolizes it differently as they age. While all people with diabetes should limit their drinking, seniors in particular may need to reduce how much they drink due to decreased liver function. Your loved one may also be surprised to find that the recommendations for normal alcohol intake are lower than he or she suspected. In most cases, seniors should limit themselves to only one or two drinks a day. For seniors with diabetes, cutting out alcohol completely can counteract the effects of aging. Changes in health or lifestyle can affect diabetes, even if they seem insignificant. For instance, adding several extra minutes of exercise to the daily routine could cause blood sugar to fluctuate more than it has in the past. Make sure your loved one has transportation to and from the doctor’s office so he or she can keep up with regular screenings and tests to make sure the current management routine works properly. If your loved one needs to make a change in the plan, help him or her stay on track by informing all of his or her caregivers so everyone is on the same page. Diabetes is a common disease among seniors, and it’s crucial to effectively manage its treatment and replace unhealthy habits with healthier ones. Maintaining a high quality of life can be challenging for some seniors, but professional caregivers can help them obtain this goal. Families can trust Winnipeg elderly home care experts to help their elderly loved ones focus on lifestyle choices that increase the chances of living a longer and healthier life. To learn about our high-quality in-home care services, give us a call at (204) 489 6000 today.